¡Feliz Año Nuevo amigos! ¿How were your holidays? ¿Did you enjoy them? This snowball is made of Spanish. We are gonna start with isolated words and by the end of this article you will be speaking full sentences, actually paragraphs. Sounds cool, doesn’t it? ¡Hola amigos! ¿Did you watch the games of “La Sele”? They did amazingly great, didn’t they? ¡¡We made historia for sure!! Last month we saw several examples when we can apply the rule. This month we are gonna see some examples of exceptions when NOT to apply the rule. Ready? The 2 WEEKS rule is a handy rule that we can use to clarify when to use “SER” and when not. It is not perfect, it is not always accurate but, as I said it’s pretty handy. This is how it works, if something might not change in less than two weeks, then we must use “SER”. -ER verbs are the second set of verbs that you need to master. You will find that a lot of the verbs that you will use in Spanish are ER verbs… Find an –ER verb, go to the 2 Times Table pattern, pick up the endings, and use the word in context, ¡as often as you can! It’s called “practice”. ¡Let’s practice! Let’s do a brainstorm using the verb comer. I am pretty sure you know why this verb is important… Right! It is important because it is the pattern that you follow when you have to conjugate hundreds of –AR verbs. I know, I know. I know that I already gave you (according to me) the twelve most important verbs EVER. I call them “The Times Tables” because as in math, if you learn them by heart you will be able to do bigger operations and; most important, you will know how to play with them the rest of your life. Feliz día de la amistad y del amor – Happy Valentine’s Day. Because this is the month of friendship I am gonna introduce you to someone that I think should be your new B.F.F. 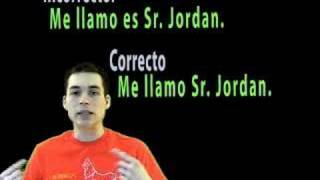 He calls himself Señor Jordan, he’s from the U.S.A. and he is very humble and funny, kind of brilliant sometimes. I think he is a hard working person, his English is as perfect as yours and his Spanish is as good as mine. ¡Feliz Año Nuevo gente! = ¡Happy New Year people! I hope you had a Feliz Navidad. ¡Bendiciones=Blessings! I know, I know. I know that this is NOT an article about matemáticas, but I want to start this year giving you (according to me) the twelve most important verbs EVER. I call them “The Times Tables” because as in math, if you learn them by heart you will be able to do bigger operations and; most important, you will know how to play with them the rest of your life. Here we go!!! Let’s play with VERBOS. PAST. Hola amig@s. ¿Todo bien? Today this column is celebrating two years of being around. Muchas gracias for reading it, and saying good things about it. You can find this and the other 22 (veintidós) articles on this website: www.OsCostaRica.com. Let’s play with VERBOS. PRESENT. Hola amig@s. ¿Todo bien? ¿Remember what we learned one year ago? I do. Let’s review it pretty quick. The verbos that end in “IR”, like VivIR. HablAR=TO speak; ComER=TO eat; VivIR=TO live. We learned that when we “play” with them, we change the endings according to “who” does the action. Just for the record, the endings of a verb are called CONJUGATIONS. Let’s review the three patterns of endings that we learned. ¿To be or not To be? Parte IV. ¿To be or not To be? Parte III. – No, no estoy mal. Estoy bien. ¿To be or not To be? Parte II. 0 – 1 – 1 – 2 – 3 – 5 – 8 – 13 – 21 – 34 – ?? 0 + 1 = 1. 1 + 1 = 2. 2 + 1 =3. 3 + 2 = 5. 5 + 3 = 8. Some people like “formulas” or “rules”; some people prefer to see things first and then try to make their own “deductions” or “patterns”. ¿To be or not To be? Parte I. ¿To be or not To be? That is NOT the question. ¿Ser or Estar? ¡That’s the question! Today it’s not about Hamlet or Shakespeare. Today it’s about the verb TO BE.